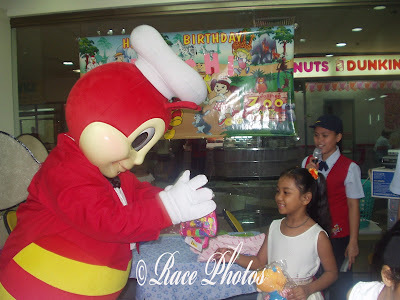 Here in the Philippines if you want kids to enjoy birthday parties just celebrate it in Jollibee and you'll surely make them happy. 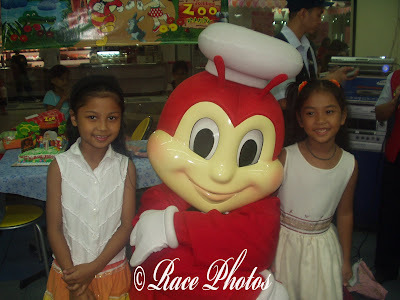 Here's a shot from my niece' 7th birthday which my brother hosted it at Jollibee in Ever branch. Josh was only 3 years old then and he's not so keen on getting close to Jollibee mascot that's why he's not included here, it's just Mitch, the birthday celebrant and Ruth. Never heared of Jollibee, but the mascot looks cute. Haha, think it was a good Party. Most toddlers are kind of afraid to be near Jollibee. Maybe he looks so enormous to them. Great photo share for the theme this week. Sweet, sweet smiles. Mine's posted also, hope you can stop by for a visit when you find some time in your busy day! Happy Saturday. Mine is up, too. I hope you like it. My condolences on the passing of Corazon Aquino.